Small world. You travel half way across the top of the globe to take on Vancouver’s finest* in the Run Canada Day 10k, and what’s actually going through your mind on the start line is the need to beat the guy from Wallington in the Great North Run t-shirt. To be fair, Vancouver’s best weren’t going to be beat (by me, anyway). The eventual winner of the 10k through Pacific Spirit Park was Tony-Carter lookalike Jeremiah Johnson, who won in 33:11, about five minutes ahead of the 2nd place runner. Second place was a Kenny Mac-lookalike, Adam Morgan, six foot something and lithe, and when the gun went, they both flew off, leaving the rest of us to battle out for the rest of the top ten. 33:11 on this course? This hot day? That was some going. I went out for a quick reconnoitre (as they say in this bilingual city) of the last mile of the course, which was an easy incline, although if I’d feel the same after 9k was debatable. I was already suffering with the humidity and heat – by 10am, when the races (beginning with the kids’ 1k) got underway, it would be in the low-20s, and climbing. And climbing. And climbing. Although not, the race organiser at Vancouver’s Running Room, warned us, until 5k, as the first half was downhill through the trails of Spirit Park, so to not go out too fast and pace it. We’d also be overtaking the fun runners/walkers on the 5k race before us, so to keep an eye out as we were letting the brakes off down the slopes. Once the 5k runners were off the first straight road, the 10k runners lined up and waited for the lead bike. I had a funny feeling I might do okay. Despite my chronic hip strain seeming to have moved from the right leg to the left in the past two weeks, apart from the first twenty or so runners, the field didn’t look very fast. And so it turned out – or, my increase in training in the past few weeks, with a firm foundation of Pilates over the last six months laid (Pilates is absolutely the future people. Fill your glutes!) is starting to pay off. 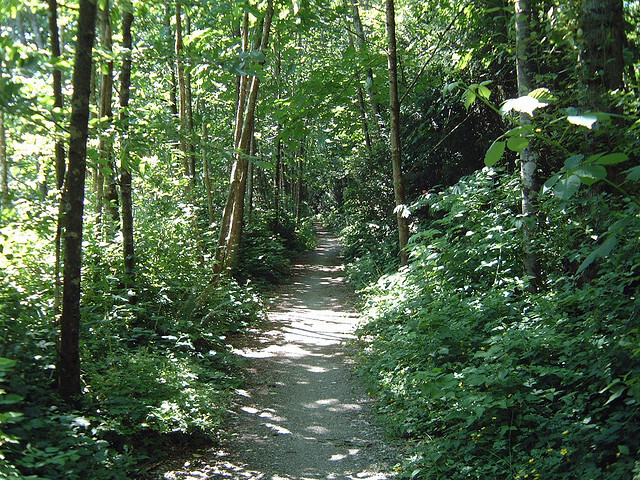 Fortunately most of the race was in the shade of the magnificent Pacific Spirit Park trails. This is a park that sits next to the campus of UBC, but was part of the traditional Musqueam peoples’ territory. During my reccy earlier I’d stopped for what I realise now was a rather sacrilegious pee in the forest, and having stopped running for a few moments I was struck by the absolute silence of the place. It was a good place to find that peace of mind that running in nature, whether it be fells, trails, beach, mountains, can provide. Although there wasn’t going to be much of that after 4.3k. Because at 4.3k that’s where the climb began. Up to that point I’d gone well. Turning into the first corner in about 12th, I picked off the two Swedes, and the heavy Wallington boots of my fellow Brit were nowhere to be heard. Then over the next 3k I slowly reeled in a Gateshead Conrad lookalike (what is it with all the lookalikes?) who I’d expected more of, for all the handshakes on the start line, and then also took a guy wearing a Spartathlon headband. But it was downhill and I was making the most of the freedom to breathe in the shade of the tall pines. Then we turned. It wasn’t a straight uphill but a twisty-turny climb, all the more difficult for not being able to see the crests of the rises. About 5k we left the shelter of the trees and hit the road, where the heat and the climb really hit hard. Luckily we were only off for 500m or so, before we turned back into the park, but then also back up. Even so, I managed to pull in the guy in front of me, until about 7k when the hilly run got the better of me, and he pulled away. I looked behind to see if I could see Conrad/Spartathlon guy, to be surprised to see a runner in yellow. Over the next kilometre he reeled me in, especially as around 8k the race took a deep incline followed by the related climb. Conditions underfoot were almost perfect. This was a really well looked after trail, solid and dry, and even though I had an ankle-wobble around the corner, that was my only mishap. It was enough to let the guy behind me pull me in, however, and when we next left the trails and got back onto the road, I let him take me, with the plan to sit on his shoulder. Mentally, here’s where I made my mistake. Because I’d planned my long run back to the other side of town to follow the race, I had an excuse for not giving it everything. It was too easy an excuse, and he pulled away. Only five seconds gap or so, but it was enough. Luckily, when we finished, I discovered he was in the 40-49 category, so it wouldn’t have made a difference to getting a top 3 in the 30-39 category. Even so, it was a mental error in a race, one not to be made again. The final kilometre was back onto the road and into Wesbrook Village and a twisty, turny path up to the finish line. I ungraciously barged my way past two slow finishers on the 5k (a mother and her six year old; hang your head in shame, young man) for a finishing time of 41:36. That’s a way off the PB, but on this course, in this heat, I was pleased with that, and knew I’d have a top 10 finish. Fourth M30-39, and most importantly for general reputation, first international finisher, all in the TBH vest. See all the results here. * not actually the reason I’m here, boss. It’s work.